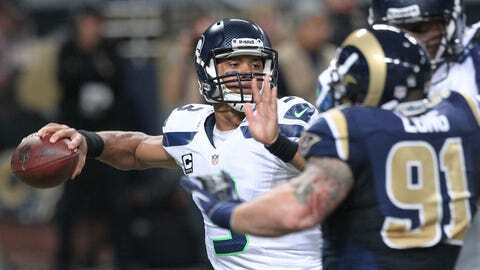 Containing Seahawks quarterback Russell Wilson on the ground will be a key focus for the Rams' defense on Sunday in Seattle. ST. LOUIS — The St. Louis Rams and Seattle Seahawks have had some battles since Jeff Fisher took over as coach of the Rams before the 2012 season. The Rams and Seahawks split their two meetings last season, with the Rams winning by six points and then the Seahawks winning by seven. The first matchup this season, a Monday night game two months ago at the Edward Jones Dome, was another close contest. Seattle escaped with a 14-9 win after St. Louis drove to the 1-yard line but wasn’t able to punch in the game-winning score as time expired. "I think Jeff (Fisher) does a great job with his team," Seahawks coach Pete Carroll said. "They play good, hard-nosed football in all phases and really good in special teams. … The fact that they’re really effective at running the football just adds to it. It’s the same formula that we like to play with, the same formula that San Francisco likes to play with, so they just bring a very tough game every time we play them. That’s what we’re expecting — nothing less." The Rams limited the Seahawks to just 135 total yards in that October meeting, including a measly 44 yards on the ground. Both were season lows for Seattle and also the lowest totals St. Louis has allowed. 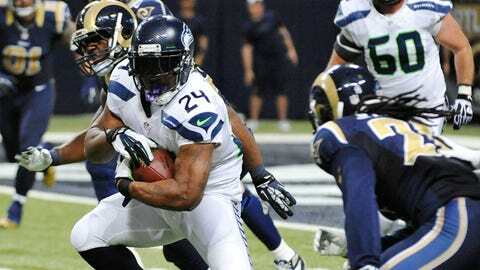 Marshawn Lynch has 1,160 yards rushing this season for Seattle. The Rams did a great job limiting Seahawks running back Marshawn Lynch, who has 1,160 yards rushing this season, to just 23 yards on eight carries, both also season lows. It’s unlikely to expect St. Louis to repeat that defensive performance, but Tim Walton’s unit has been one of the best in the NFL at negating the run this season. "We’ve got to go out and stop the run," said Walton, the Rams’ defensive coordinator. "They have a very good running attack. I think they’re third in the league in rushing. So we’ve got to make sure we stop (No.) 24 (Lynch) from running the football and keep the quarterback contained with his feet. So, that’s where it all starts with us." The Rams rank seventh in the league in run defense, allowing 102.3 yards rushing per game, on the season but rank first over the past seven weeks. St. Louis is allowing just 68 yards rushing per game over its last six contests, in which the Rams are 4-2. They are also allowing a league-low 2.8 yards per rushing attempt during that time. "We have to go and play well in the run game," Walton said. "That’s where it all starts with us. When we stop the run early and teams can’t run the ball and they have to drop back and throw it. That really plays into the strength of our guys that can rush and then get our hands on balls and force the quarterback to make errant throws. So, it all starts with that. We’ve got to keep it going. We have to finish that strong." The Rams’ rushing attack was a key factor in the first meeting with the Seahawks, with Zac Stacy and friends racking up 200 yards on the ground. "It just doesn’t happen to this defense," Rams offensive coordinator Brian Schottenheimer said. "Certainly they’ll adjust. We felt good about our ability to do it, but certainly we didn’t win the game. They found a way to win the game and that’s the objective. It doesn’t matter how many yards we have running, throwing, anything. We want to get the win, but again it’ll be tough sledding this week. They’re a real good group up there. They’re really talented. They move a lot. They’ve got a lot of depth and that makes it hard." 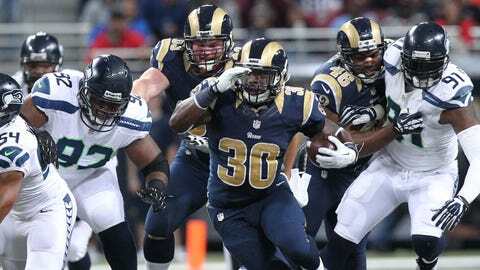 Zac Stacy rushed for a season-high 134 yards in the Rams’ Week 8 loss to Seattle, his first of four 100-yard games this year. Stacy, the rookie running back from Vanderbilt, is closing in on 1,000 yards rushing despite getting just one carry in his first four games. He has 958 yards rushing that includes four 100-yard games, is averaging 4.1 yards per carry and has scored eight total touchdowns (seven rushing, one receiving). He needs just 42 yards to hit 1,000 and would extend the Rams’ impressive streak of rushers hitting that mark. Steven Jackson accomplished the feat in his final eight seasons in St. Louis. Stacy ranks 13th in the NFL in rushing — he’s second among rookies behind Green Bay’s Eddie Lacy (1,112 yards rushing on 4.2 yards per carry) — and is averaging 86.7 yards rushing per game in 11 starts. That mark is the third-best in the NFL behind only Philadelphia’s LeSean McCoy (98.4) and Minnesota’s Adrian Peterson (90.4). "It’s not just Zac," Schottenheimer said. "Certainly, he gets a lot of the credit for what he’s done, but certainly that group up front, we’ve been mixing and matching a lot of linemen in there. (Offensive line coach) Paul Boudreau and the offensive line have done a great job, but Zac’s having a great season and he does a lot of little things for us too. Pass protection doesn’t go unnoticed by us. Again, just excited to have him here and he’s just going to get better and better each and every year." Stacy’s rookie season has been similar to what his predecessor, Jackson, accomplished during his time in St. Louis. In Jackson’s nine seasons with the Rams, he averaged 1,126 yards rushing, 4.2 yards per carry and seven total touchdowns per season. What can Robert Quinn do for an encore? Quinn has five sacks in the past two games and last week broke the team’s single-season record for sacks. He now leads the NFL with 18 and is second in the league with seven forced fumbles. The third-year defensive end from the University of North Carolina had three sacks in the Monday night matchup two months ago and has six in five career games against the Seahawks. 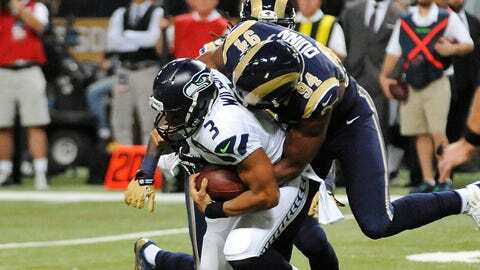 Rams defensive end Robert Quinn (94) leads the NFL with 18 sacks this season. "He’s having the season and effectiveness that Aldon (Smith) had at the Niners," Carroll said. "It’s very similar. Our whole division is loaded with guys. Robert’s having that kind of season. I think Aldon had 18 or 19 sacks or something a year or two ago, and it’s that kind of impact where every snap you’re just concerned that he’s going to come ripping off the edge. Robert has really grown into a great football player." Quinn’s teammates have been campaigning for him as the defensive player of the year the past two games and this will be another opportunity for Quinn to state his case. The Seahawks have two candidates for the award in safety Earl Thomas and cornerback Richard Sherman. So the regular season finale will serve as the last chance for all three players to show why they are worthy of the award.